. كما يقدم Breakfree Capital Tower Hotel الكثير من الخدمات لإغناء رحلتك في كانبرا. يمكن الاستمتاع بمجموعة من الخدمات على أعلى المستويات في الفندق كمثل تسجيل وصول/خروج سريع, تخزين الأمتعة, صف السيارات, رعاية أطفال, غرفة عائلية. لقد جهزت هذه الإقامة الفندقية بعناية فائقة لتوفر مستوى عالي من الراحة. في بعض الغرف يجد النزيل تلفزيون بشاشة مسطحة, حوض الاسترخاء, غرف لغير المدخنين, مكيف هواء, تدفئة. يقدم الفندق خدمات رائعة كمثل مركز للياقة البدنية, ساونا, حمام سباحة خارجي, ملعب تنس, ملاعب سكواتش لمساعدتك على الاسترخاء بعد نهار طويل من النشاط والتجوال في المدينة. استمتع بخدمات لا يعلى عليها وعنوان ذو اعتبار في Breakfree Capital Tower Hotel . مكتب الإستقبال مفتوح من 07:00 صباحاً إلى 10:00 مساءً. الضيوف الذين سيصلون خارج هذا الوقت يطلب منهم التواصل مع العقار مباشرة قبل موعد الوصول لترتيب هذا الأمر. تبلغ تكلفة خدمة الواي فاي في الغرف 15 دولار أمريكي في اليوم. The carpet and internal areas are very dated but clean enough. However, the rooms are large and parking was only $10.00. Staff were friendly and upgraded me for free. It was a very reasonable cost as well compared to others in the area. Being upgraded to 11th, nice view so we ask the receptionist to stay one more day in the same room. They said no problem and tell us to book with agoda again, we did even we have to pay $28.00 Cad higher. In the morning 8am, they told me that we have to checkout and then checkin again because we have to stay in other room. I just ask for higher floor! They ask for my phone to call when room is ready! Out of the hotel and wait until noon. Back to hotel, they gave us 1st floor ! If we knew they don’t keep their word; we don’t stay! Bad service! Otherwise everything was good! Everything was good, travelled with families (2 kids) got a free up-graded to 3br apartment. There was only one drawback about the noise of air condition in the master room, could not sleep. had to moved to another bedroom. (this would be the reason for up-garding, i guess!!!). 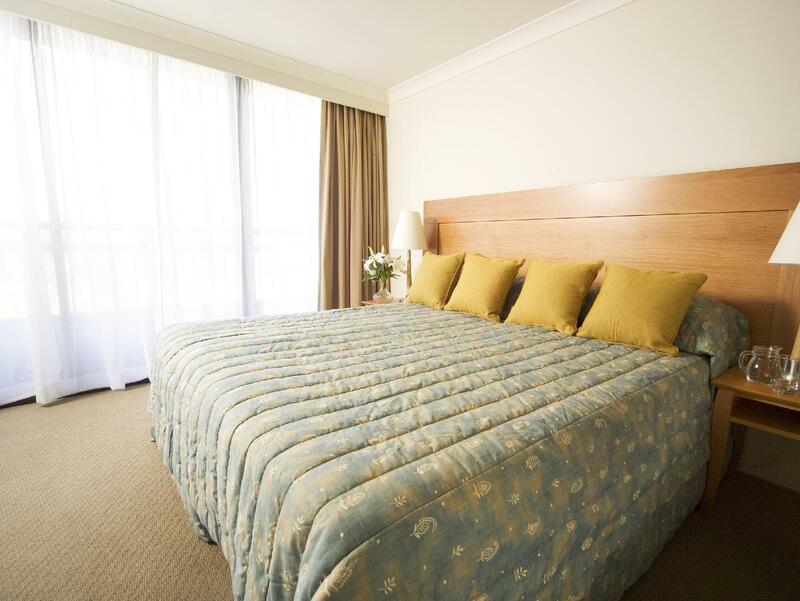 Otherwise fine, good location (right next to Commonwealth Park), affordable price from agoda. I went to Canberra for the Questacon and the Griffin lake. 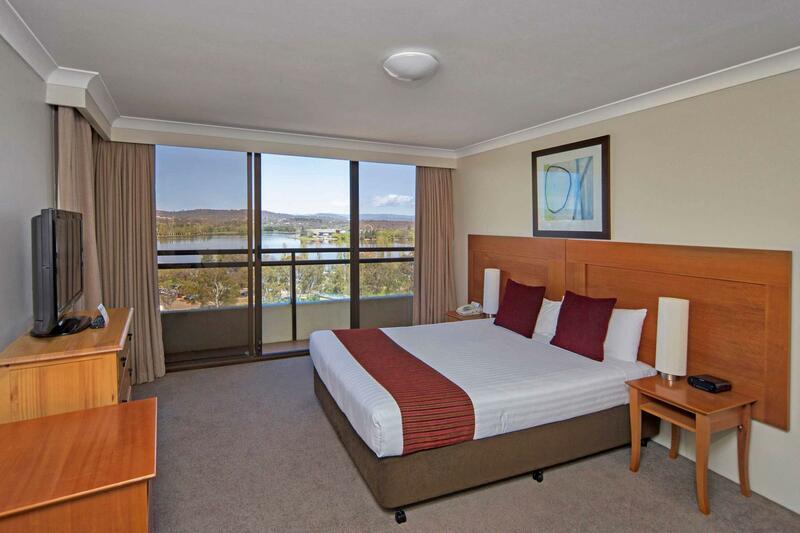 The hotel is located just across the lake, and about 5 mins drive to Questacon. In addition, it is only 10 mins walk to Bunda street, that offers rows of restaurants. In addition, as it is an apartment type of hotel, we have a spacious 2 bedrooms unit with 2 bathrooms and a kitchen, and a balkon facing the lake. This is another plus point for the hotel. 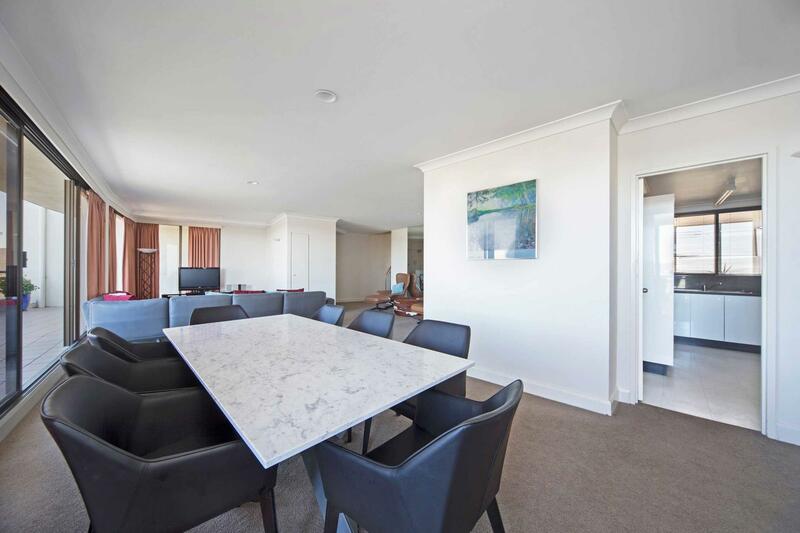 Photos on website exaggerate size and condition of apartment. The reality is an older (well used) apartment with airconditioning that only has duct in living area. Bedrooms do not have aircon ducts and windows don't open, so on a hot night it is stuffy and uncomfortable in the bedrooms. Drapes are old and do not cover the entire span of windows so unable to block day light out if required. It was clean and did offer the basics of what we needed . I just felt that what was portrayed on the website looked larger and more glamourous than what we got . Gym, pool, tennis courts , building security all impressive . Undercover and open air parking is $10 a night. It’s quite some walking distance to town area. Nothing special. Is a 2 bedroom apartment with living area, dining, kitchen (oven, microwave and fridge), washing machine and dryer, and a balcony. The unit we staying is facing the lake view. Wifi only available at lobby. Swimming pool is close for maintenance. Perfect location within walking distance of a lot of the attractions. Spacious apartments. Bit dated but clean and well maintained. our apartment was upgraded on arrrival, so that is always a good start. The desk staff were very friendly and helpful and provided plenty of information. It is quite close to ANU and was a simple and pleasant walk away from everything we needed. The apartment was spacious and well appointed. My only criticism is that as a business hotel free wi-fi should be a standard. We had problems with the paid-for system that was a bit of a nuisance since we had work to do. Not Break-Frees fault, but my advice is to splash-out on free wi-fi and make everyone happy. Recent stay at the Breakfree Capital Tower Hotel was great. The 3 bedroom apartment was perfect size and great cooking facilities. I highly recommend staying here if you want a good location and nice room! 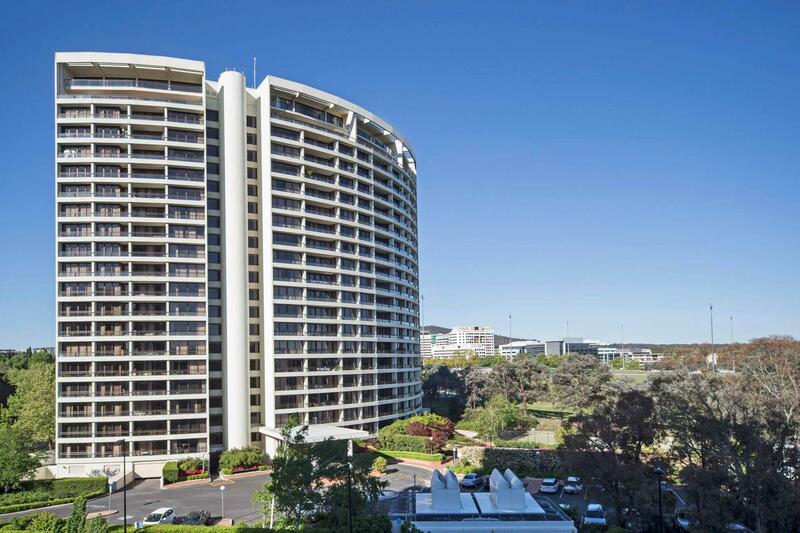 We stayed in Apartment 603, very spacious with a fantastic view over Lake Burly Griffin & Parliament House it has a great Location & very pleasant staff. However the Apartment was exceptionally tired & run down, carpet & curtains were stained & I mean stained from Lounge to Bedroom. Majority of the walls had paint chips & the balconies were filthy. Toilets ran all night & we were advised by reception to turn the water off at the wall until morning when a serviceman could have a look. Spend some money & give the place a paint job & have the carpet & curtains cleaned for stains. Needs some TLC, I expected more from our countries capital, dread to think of what Overseas guests must think on the condition of this Apartment. Shame! We enjoyed our overnight stay thoroughly & will stay again. Service desk staff was wonderful & happy to accommodate my friend & I checking in at different times. Apartment was clean & an extra towel was easily located in the room cupboard. Very happy. Position, Comfortable beds, large rooms. 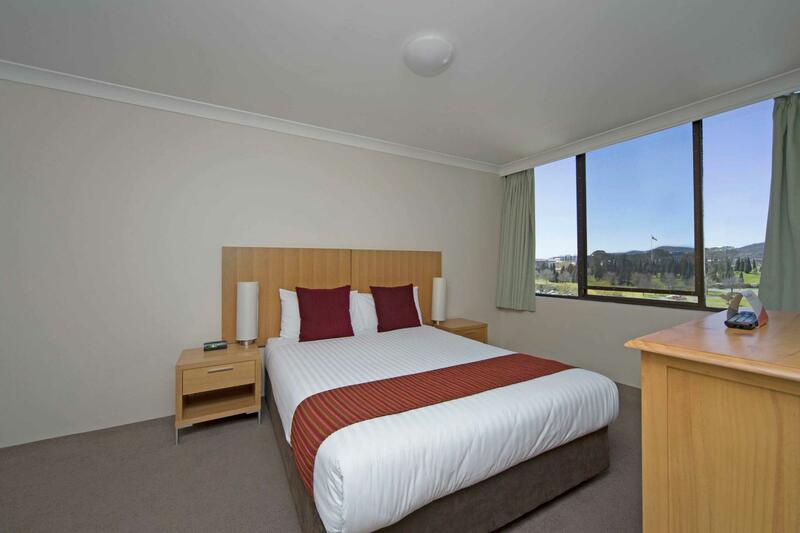 When taking your relatives for a sightseeing visit to Canberra you want proximity to tourist sites, A comfortable bed at night, and a retreat that feels like home. We got all three at Breakfree Capital Hotel. To get all of this you have to concede traffic noise waking you early in the morning. 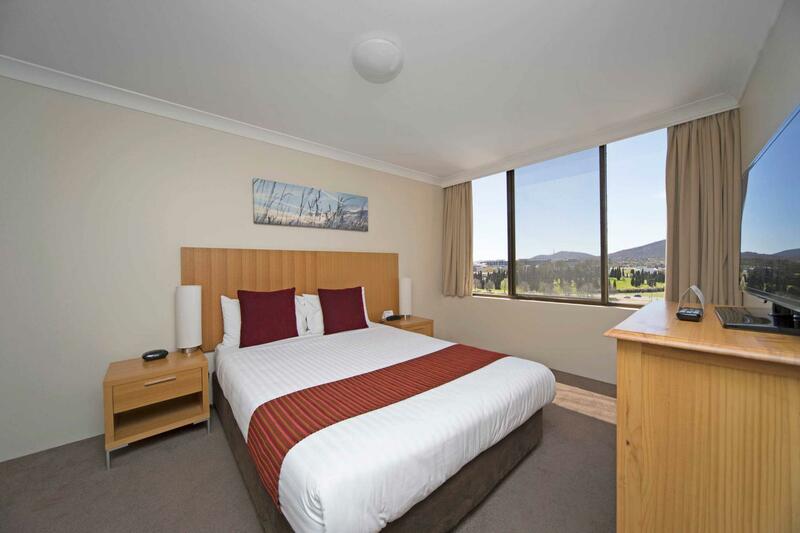 The best apartment to stay when in Canberra! The staffs are really good! We had to checked-out at 12noon and they did not charge us extra. Highly commendable for a big family. We will surely stay here when we come back to Canberra City! Free parking, freindly staff and complete with facilities. A very pleasant stay. The hotel is very clean and comes with all facilities. We even get wash and dry our clothes before moving on to Sydney. It would have been better if wifi is available in the room instead of hotel lobby. The city view apartments do not include a balcony unless you phone up first to request one. They also do not include a/c in the bedrooms. Car parking is another $10 on top. The lake view room I was put into after complaining was spectacular - 3 balconies, air conditioning and clean. Nicer layout too. Some staff were nice some were.. shall we say 'testy'. Usual mix of humans really. Arrived on bank holiday and so no cleaning staff and had to wait until 3.30pm to check-in (I arrived at 11am). Everything clean, the apartment was actually bigger than I required. Staff great. The unit was in a very convenient location - walking distance to city centre, movies and local shop opposite. The unit was very spacious.